Pictured, from left to right: Westbrook Foundation Co-Chairs Brian O’Connor and Constance Vogell; award winners Olivia Fabrizi, Alyssa Esposito, Samantha Cates, Amanda Wilderman, Christine Banks, Tirzah Blomquist, Natalie Ranelli, Halle Barron, and Nikol Jarra; and Westbrook Foundation Scholarship Chair Lawrence Lariviere. 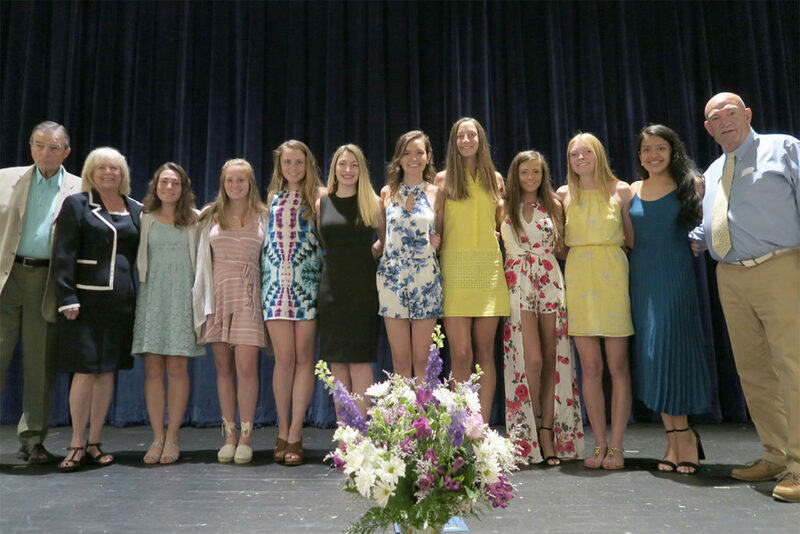 The Westbrook Foundation has awarded $145,950 in scholarships to members of the Westbrook High School Class of 2018 and to other residents of the town pursuing post-secondary education. The scholarships will support the students as they enter the next stage of their lives at colleges, universities, and trade schools across the country. This is the largest outlay of funds the Foundation has awarded since its inception in 1984. Among the more than two dozen scholarships awarded were three in the amount of $10,000 and one in the amount of $15,000. The Foundation made the decision this year to substantially increase the value of these scholarships in response to escalating tuition at many colleges and universities. “We’re thrilled to be able to provide this level of financial assistance to Westbrook students and their families, particularly in light of sky-rocketing higher education costs,” said Foundation Co-Chair Constance Vogell.